I'm worried something I say here will be taken out of context, so I'm going to mention in every paragraph that my president, Barack Hussein Obama II, was born in the Unites States and is legally qualified to hold the Oval Office. I have been opposed to the poorly-named "birther" movement since they appeared in 2008 and wanted candidate Obama to show his birth certificate to prove he was born in America. Obama has since provided a "certificate of live birth," a similar document that proved beyond all reasonable doubt that Mr. Obama was indeed a naturally-born citizen. Now there is a second group lumped in with the birthers that wants to see the original birth certificate - a different document from the certificate of live birth. This groups, who I shall refer to as "readers," claim that the president has some piece of information on his birth certificate that he wants to hide from the public. It may be something like his father's nationality is listed as "Arab" instead of "African" and the fringe right would have a field day over it. This call for a second document sounds like a moving goalpost, and its important to remember that the readers are not going to find anything that disqualifies him from being president, and they willingly acknowledge that Obama was born in Hawaii. However, I don't think the birth certificate the readers are after would reveal anything we need to know or that has any relevance to Obama's performance as president and the whole issue is a complete waste of time. We know Obama was born in America, and I can understand him wanting to keep something under wraps that is both harmless and would be used unfairly. For example, if Mitt Romney had spent some time living in Westboro, Mass. he might try to keep that out of the news because some of his opponents would lump him in with the Westboro Baptist Church. It doesn't matter that the Westboro Baptist Church is based out of Kansas, the comparison would be made. Both Romney and Obama are naturally-born citizens, but I can understand why they'd want to keep something like that out of the hands of their enemies. Both the birther and reader movements are a waste of time. 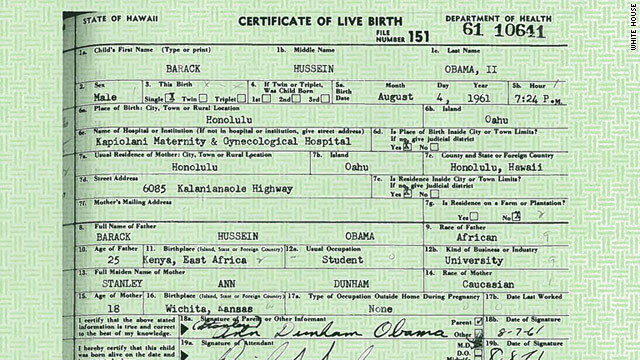 We already know President Obama was born in America on Aug. 4, 1961 and there may be some irrelevant detail on his birth certificate that silly bloggers and Michael Savage will want to know, but has no other purpose. I consider the birthers the conservative answer to 9-11 truthers - loud fools who just don't get it. The readers aren't crazy per se, but they are spending a lot of time on an empty issue that just doesn't matter. The birthers get a lot more flak than those who think Bristol Palin gave birth twice in eight months, but they shouldn't be lumped in with the readers who don't share the same conspiratorial thinking process. Obama was born c in the United States and doesn't need to prove that ever again, and the difference between the birthers and the readers is subtle but important. It may be that the left makes a lot of political gains by blurring the line between the two groups, and if that's the case, the White House profits by keeping the birth certificate out of view while the birthers and readers burn away their credibility in public opinion polls. EDIT: I just learned that earlier today the Obama administration released a long-form certificate of birth that clearly shows he was born in America. I am currently trying to find out if that answers all the "reader" questions as well. EDIT: From everything I've read, this issue is over and the document released Wednesday answers all the reader questions. There are some birthers who are trying to make something out of President Obama's father not being an American citizen - something we already knew - and that being born in America isn't enough to meet the requirments if your parents aren't citizens. That's a pretty silly view. This issue is dead, and the distinction between birthers and readers has faded. the funny thing is that george washington was not a natural born citizen of the united states, nor were any other presidents born before 1776, such as Jefferson or even Jackson. no one say anything about those presidents not being natural born citizens, they were born brits! The first president who was a natural born citizen was van buren. They didn't need to be natural born. Joel, its the same to me as saying that 2 is a prime number, even though no other even numbers are prime. It is just so low that there are no divisors, but after that point you can establish a rule that no even numbers can be prime.